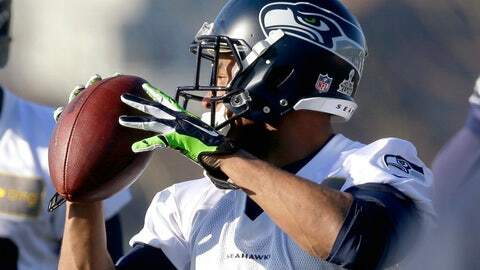 Seahawks WR Percy Harvin practices Thursday. With all the setbacks Percy Harvin has faced in his first season with Seattle, it would be easy to dwell on the problems. Harvin is trying not to linger on the past, whether it was his hip surgery and recovery that kept him out of 15 of 16 regular-season games or the concussion that left him a spectator for the NFC championship game. Not with the Seahawks headed for a Super Bowl matchup against Denver. Harvin returned to practice Wednesday after passing the league’s concussion protocol following the concussion he suffered in the NFC divisional playoff game against New Orleans. The injury was the latest bump in a season filled with starts and stops for Harvin. First was the trade from Minnesota and a lucrative contract with Seattle. Then came the discovery of a damaged labrum in his hip that required surgery in early August and caused him to miss the first 10 games of the regular season. When he returned in Week 11, Harvin was used sparingly, but the amount was too much for his hip and complications followed. He returned for the playoffs and was a significant part of Seattle’s game plan against the Saints in the divisional round when the next setback hit. Harvin’s head bounced off the turf of CenturyLink Field after leaping for a pass in the end zone in the second quarter of Seattle’s 23-15 win. And again, Harvin was left to be a spectator. Hitting his head on the turf, just as New Orleans safety Malcolm Jenkins was hitting him in the back, was the second big hit Harvin took against the Saints. He said Thursday he did not believe he was being targeted. Harvin was hit by safety Rafael Bush in the first quarter of the game, a hit that drew a 15-yard penalty and a $21,000 fine from the NFL. ”I thought they were just playing football,” said Harvin, who said his history with migraines had no influence on the speed of his recovery from the concussion. The opportunities Harvin got against the Saints showed just what he could add to Seattle’s offense. He was used as a runner on a sweep to the perimeter that went for 9 yards and could have gone for more. Seattle tried to find him on deep routes down the seam of the defense and also underneath crossing patterns. He was also a successful decoy. On Marshawn Lynch’s 15-yard touchdown run against the Saints, Harvin faked that he was about to catch a screen pass. The defense reacted and Lynch had a cutback lane open en route to the end zone. Despite all the setbacks, Harvin’s not viewing the Super Bowl as an opportunity to salvage his season.